The U.S. Capitol is seen above in 2009 as senators worked late into the night on legislation. 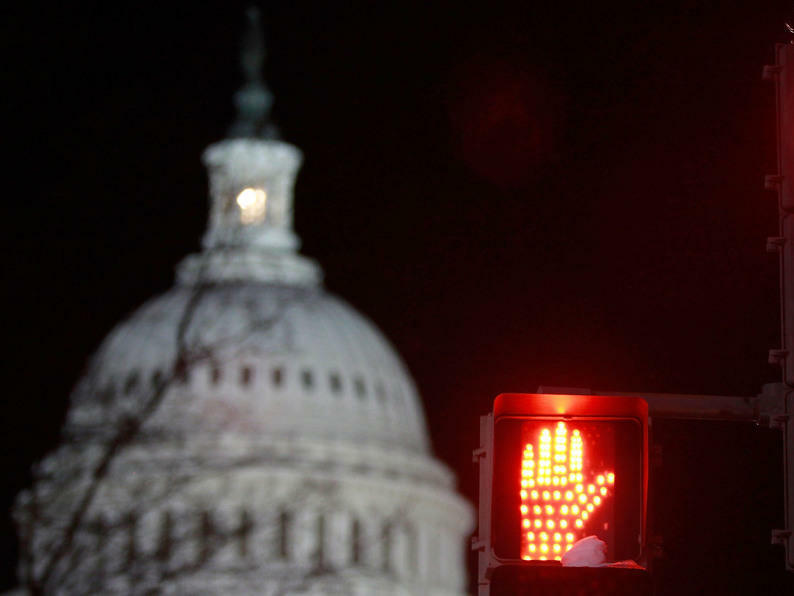 The light signifying that Congress is in session may remain on this holiday season as well, since House Republicans have said they will remain in a pro-forma session. 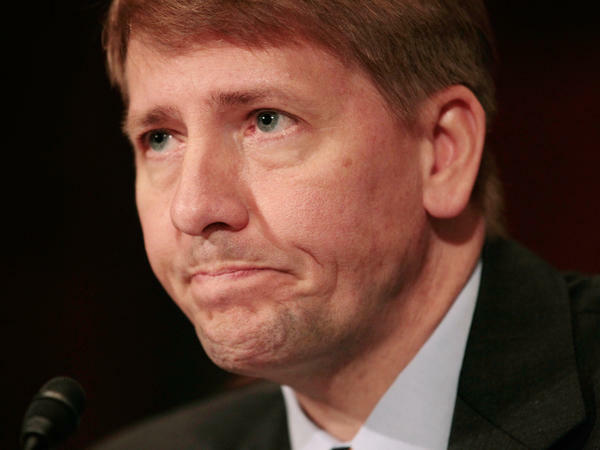 Richard Cordray testifies during his confirmation hearing on Capitol Hill in September. His nomination to head the consumer watchdog agency was blocked by Senate Republicans on Thursday. Obama insisted, "I will not take any options off the table when it comes to getting Richard Cordray in as director of the consumer finance protection board." The only way the president can make a recess appointment for Cordray is if Congress is actually in recess. And ever since late May, Congress has remained in permanent session, mainly because Republican lawmakers want to prevent any more recess appointments. Donald Ritchie, the Senate's official historian, says several presidents have used a constitutional provision that allows them to convene a session of Congress. "But there is this other provision that says, well, if the two houses themselves can't agree on an adjournment, the president can adjourn Congress," Ritchie says. "It's just that no president has ever exercised that constitutional authority." Utah Republican Sen. Orrin Hatch says taking such a measure "would be a very unwise political thing to do." Hatch doubts President Obama would actually exercise his constitutional power to adjourn Congress in order to make recess appointments. "It would make him look like he's stupid, because as much as he hates Congress, or ... [as a] more fair statement, might hate Congress, he still needs it," Hatch says. It's not likely the president would even have the option of adjourning Congress, because the only way he can do that is if one chamber adjourns and the other one doesn't. House Republicans intend to remain in pro-forma session throughout the holidays, and a spokesman for Senate Majority Leader Harry Reid says it's likely the Senate will do the same. Congressional expert Ross Baker of Rutgers University says the chief concern of the Senate's top Democrat may be the 23 Democrats facing re-election bids next year. "He's really in a position where he's trying to do everything he can to protect those 23 Democrats, so that may or may not coincide with the interests of President Obama," Baker says. The question of what constitutes a congressional recess has never really been settled. Betty Koed, an associate Senate historian, says that in 1903, Teddy Roosevelt used an almost nonexistent congressional break to make recess appointments. "When the presiding officer brought the gavel down to end one session, he simultaneously began the next session," Koed says, "And in that split second it took the gavel to go down, Roosevelt appointed 193 people." Catholic University law professor Victor Williams says President Obama should show similar audacity. "He should not ignore the pro-forma sessions," Williams says. "He should explicitly, deliberately challenge them." If he doesn't, Williams says, a pattern of pro-forma sessions shutting off recess appointments that began late in the Clinton administration will only continue, leaving key posts in the administration vacant. Sen. Jeff Merkley, an Oregon Democrat, agrees. "At some point, the abuse of process by my Republican colleagues means that the president should consider any constitutional legal means to make our government work for working Americans," Merkley says. But the president's options, at this point, appear very limited. This week, Senate Republicans blocked confirmation votes on two of President Obama's high-profile nominees. One is in nominated for a seat on the federal appeals court, the other to head the new Consumer Financial Protection Bureau. Traditionally, the end-of-the-year holidays have allowed presidents to go around Congress and make recess appointments. But as NPR's David Welna explains, this year, that's not likely to be the case. DAVID WELNA, BYLINE: An hour after Senate Republicans blocked an up or down vote on the nominee to head the new consumer agency, an angry President Obama was in the White House briefing room putting Congress on notice. WELNA: But the only way the president can make a recess appointment for Cordray is if Congress is actually in recess. And ever since late May, Congress has remained in permanent session, mainly because Republican lawmakers want to prevent any more recess appointments. Donald Ritchie is the Senate's official historian. He says several presidents have used a constitutional provision that allows them to convene a session of Congress. DONALD RITCHIE: But there is this other provision that says, well, if the two houses themselves can't agree on an adjournment, the president can adjourn Congress. It's just that no president has ever exercised that constitutional authority. SENATOR ORRIN HATCH: It would be a very unwise political thing to do. WELNA: That's Utah Republican Senator Orrin Hatch. He doubts President Obama would actually exercise his constitutional power to adjourn Congress in order to make recess appointments. HATCH: It would make him look like he's stupid, because as much as he hates Congress or might hate - a more fair statement - might hate Congress, he still needs it. WELNA: It's not likely the president would even have the option of adjourning Congress because the only way he can do that is if one chamber adjourns and the other one doesn't. House Republicans intend to remain in pro forma session throughout the holidays, and a spokesman for Senate Majority Leader Harry Reid says it's likely the Senate will do the same. Congressional expert Ross Baker of Rutgers University says the chief concern of the Senate's top Democrat may be the 23 Democrats facing re-election bids next year. ROSS BAKER: He's really in a position where he's trying to do everything he can to protect those 23 Democrats so that may or may not coincide with the interests of President Obama. WELNA: Other presidents have tested the limits of their recess appointment powers, mainly because the question of what constitutes a congressional recess has never really been settled. Associate Senate historian Betty Koed says, in 1903, Teddy Roosevelt used an almost nonexistent congressional break to make recess appointments. BETTY KOED: When the presiding officer brought the gavel down to end one session, he simultaneously began the next session, and in that split second it took the gavel to go down, Roosevelt appointed 193 people. WELNA: Catholic University law professor Victor Williams says President Obama, who evoked Teddy Roosevelt repeatedly in a speech this week, should show similar audacity. VICTOR WILLIAMS: He should not ignore the pro forma sessions. He should explicitly, deliberately challenge them. WELNA: If he doesn't, Williams says, a pattern of pro forma sessions shutting off recess appointments that began late in the Clinton administration will only continue. Key posts in the administration will be left vacant. Oregon Democratic Senator Jeff Merkley agrees. SENATOR JEFF MERKLEY: At some point, the abuse of process by my Republican colleagues means that the president should consider any constitutional legal means to make our government work for working Americans. WELNA: But the president's options at this point appear very limited. David Welna, NPR News, the Capitol. Transcript provided by NPR, Copyright NPR.